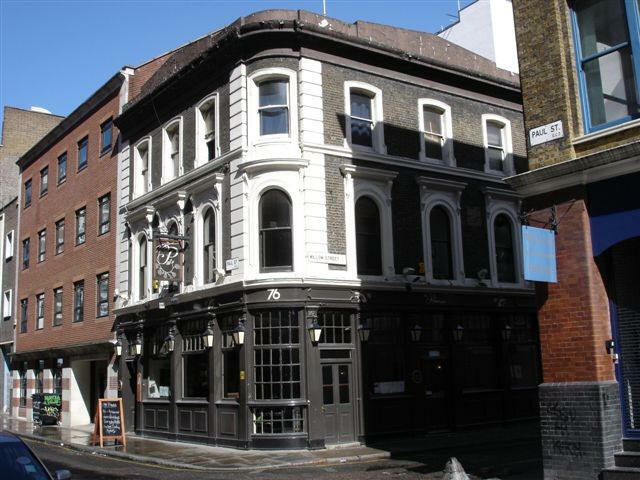 A listing of historical public houses, Taverns, Inns, Beer Houses and Hotels in Shoreditch, East London. Richard Hollyman was born about 1800 in Bierton, Buckinghamshire, and married to Sarah Miles in 1829. They were later at the Dolphin, and also likely to have been licensees at the Harrow, Stratford. They had seven sons who were all licensed victuallers or working at public houses at some stage in their lives. Richard died aged 54, on the 3rd August 1854 at 16 Long Alley, Shoreditch; and his wife Sarah continued running pubs for many years. Their sons were Thomas born in 1830, William born in 1831, Richard born in 1834, Henry born in 1838, Alfred born in 1842, Robert born in 1845 and Joseph born about 1850. By 1847, Richard Hollyman is probably living in Hunter Street, a dairyman, at the birth of his son, Henry. It is highly likely that he is at the Harrow, Stratford for a short period of time. By November 1849, the family has arrived at the Dolphin, Long Alley, Shoreditch.